The Declaration of Independence	was proclaimed from the same balcony on which royal governors had gazed down on British colonists. The Freedom Trail eventually brings you to the Old State House at 206 Washington Street (map), just up the street from Government Center and right above the State Street MBTA subway station, dates from 1713. 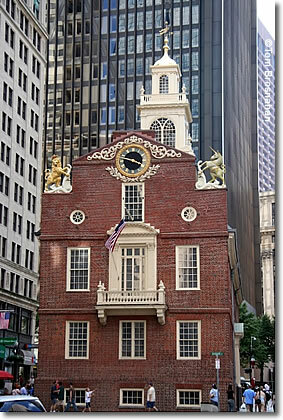 Dating from 1713, the Old State House is the oldest surviving public building in Boston, and was constructed to hold the governing offices of the Massachusetts Bay Colony. It replaced an older colonial government building (1658) that burnt in 1711. The Council Chamber of the Royal Governor was on the second floor, along with the Massachusetts Assembly and, later the Massachusetts Supreme Judicial Court. Merchants did their business on the ground floor. John Hancock and others used the basement as a warehouse. Important proclamations were read from its second-story balcony, and it was beneath this balcony on the evening of March 5, 1770 that British soldiers fired on a threatening mob of civilians, resulting in the Boston Massacre. The Declaration of Independence was first read to Bostonians from its balcony in 1776. From that same balcony, George Washington addressed the citizens of Boston in 1789. After the American Revolution it was known as the State House, and after the present State House was built in 1795, this one became the Old State House. Now that the building is hemmed in by giant buildings on all sides, much of the dignity and prominence it must have held for colonial and revolutionary Americans is lost. Inside, a museum operated by the Bostonian Society has changing exhibits. The Old State House, Boston MA. Imagine the Declaration of Independence being read from the balcony!